Altimeter Groups’s latest Open Research report (available on creative commons for you to download, use, and share) is now available from analyst Brian Solis. This report, which challenges the way that companies measure influence points out how tools like Klout, Kred, Empire Avenue and beyond. In fact, companies are quick to add influence metrics into their social support systems, and marketing prioritization despite having full understanding of how these measurement tools actually create their indexes. This report, written as a playbook for businesses focuses on how to benefit from desirable effects and outcomes through social media influence. The report also helps consumers and academics understand how influence is scored and how these scores affect online reputations. We practice Open Research, and hope you use it, share it, which enables us to create more. Here’s some key insights from the report, that drew my attention. Influence is largely misunderstood, in fact the report makes a nod that these tools like Klout, Kred actually measure social capital — not your influence but instead, your potential for it. The report helps companies understand how influence spreads, and includes case studies in which brands partnered with vendors to recruit connected consumers for digital influence campaigns. The report evaluates 14 Influence vendors, organizing them by Reach, Resonance, and Relevance: the Three Pillars that make up the foundation for Digital Influence as defined in the report – not every service is designed to provide a total solution for every business need. The report includes an Influence Framework and an Influence Action Plan to help brands identify connected consumers and to define and measure strategic digital influence initiatives. The report demonstrates a path how businesses should properly measure the impact of influence –not just look at an index number. Note how the further to the right, it actually demonstrates the outcome of the influencer, their network, and what actually happened. 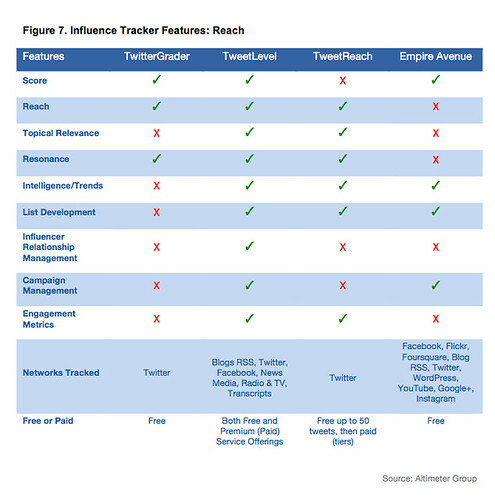 Above is a sample: Dive into report to see feature comparison of all vendors, which breaks down feature comparison by: Score, Reach, Influencer Relationship Management, and beyond. Vendor POV: Traackr: Brian Solis’ “The Rise of Digital Influence” – a bit too shallow? Janson Group: Is Klout a Crock? Greenough: Is Klout-Score Marketing the Path of Least Resistance? 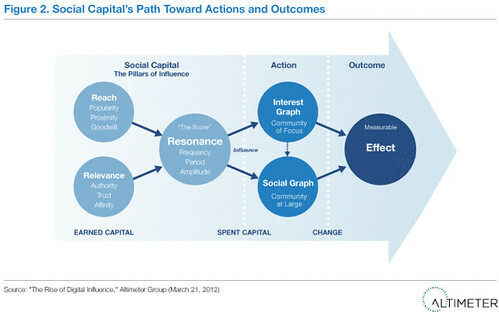 Bostinno: Does Social Influence Matter? Learn about Altimeter’s three business disruption themes and upcoming report agenda to learn how our research will the industry forward. Edit: I updated the post to include the phrase about potential and kinetic energy based of a conversation with Richard at Dell.